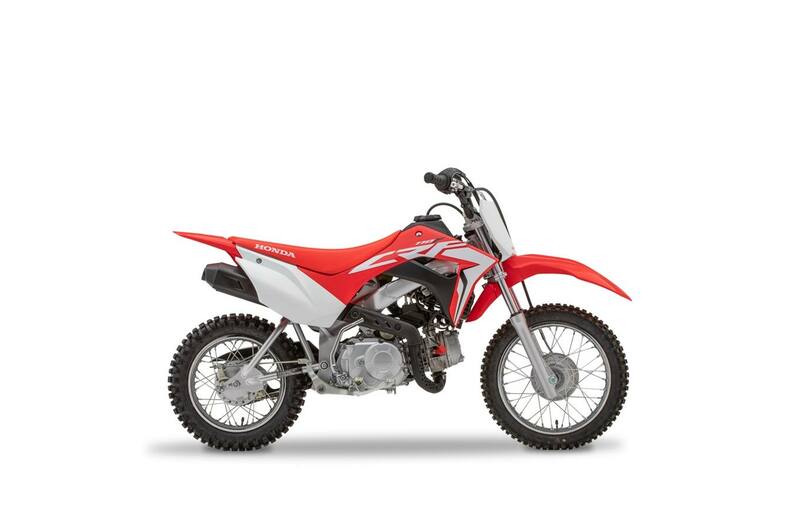 Tuned for the beginner: Dependable 4-stroke air-cooled single-cylinder 109 cc engine is tuned to lend confidence to beginner riders. Linear power delivery: New PGM-FI electronic fuel injection ensures a smooth flow of power for easier handling, plus trouble-free operation and maintenance. Extra info: Handy LED lights indicate ignition ON, low fuel, and PGM-FI status. No second guessing if you've left the key on or you're about to run out of gas, and another way the CRF110F helps young riders learn the basics of motorcycle operation. No-stall take-offs: Four-speed gearbox with automatic clutch offers simple operation with easy, no-stall take-offs. New twin-spar frame: New CRF-R-inspired twin-spar frame provides a stable foundation for both novice and skilled young riders. Easy to mount & control: Low seat height of only 667 mm (26.3 in.) gives young riders added confidence as they learn. Great traction & stability: Upgraded suspension offers excellent traction and stability for added confidence over rough terrain. The 31 mm leading-axle Showa front fork has 110 mm (4.3 in.) of travel, while the rear Pro-Link® Showa single shock absorber provides 97 mm (3.8 in.) of travel. Protective bodywork: Extended muffler cover provides extra rider protection. New durable fuel tank: Plastic-injected fuel tank with integrated fuel pump adds to the CRF110F's legendary durability and ease of use.